How does a little "composure" sound to you? Wouldn't it be great to be able to eliminate some of the stress in your life without having to actually eliminate the source of the stress? ...and those are just a few of the biggest causes of stress that many of us face on a daily basis. 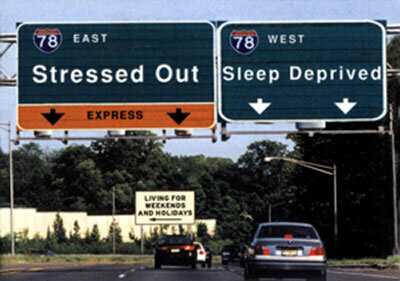 Some people don't realize how stress affects your overall health. Did you know that doctors even say that stress encourages the growth of cancer and other diseases in your body? If you are sick and tired of feeling sick and tired and irritable, unable to sleep, fighting anxiety and depression, it's really time you do something for yourself and your family. Is There An Herbal Remedy For Stress? Have you ever wondered if there was a natural supplement for stress that you could take to give you a better night's rest? A calmer spirit? A more relaxed body? Is there an herbal remedy for stress that won't leave you with lasting and damaging side effects? Something better than the uppers and downers of previous generations, often referred to as "mother's little helpers?" Composure is exactly that! 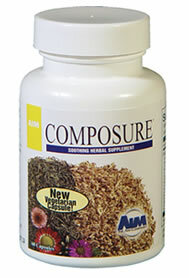 Composure is a combination of natural herbs (extracts and whole herbs) that work together to ease the tensions in your body so that you can sleep better and reduce your stress levels, even calming your nerves. These capsules can also be used to help relax your muscles so that your bowels can function more easily, so you don't have to strain and struggle to have a healthy bowel elimination. There are two types of Composure available - the US Formula and the Canadian Formula. 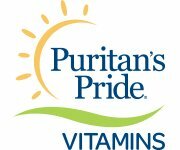 Both formulas have been tried and tested for their effectiveness in pain and stress reduction. Canada has brought in certain governmental restrictions that made it necessary for AIM to develop a different but effective formula to replace the original Composure. Alfalfa - for the stomach and the blood. Alfalfa is a nutritiously rich grass that contains chlorophyll, vitamins, including A, D, E, K, and beta carotene, and minerals, including selenium. Alfalfa has also been recognized as an effective overall tonic used for rebuilding the body after serious or prolonged weakness or illness. Irish Moss - for the lungs, kidneys, and skin. 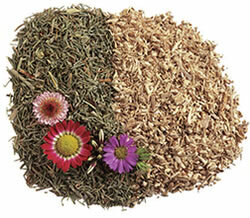 Irish Moss contains 15 of the 18 different elements that make up the human body. Some of its benefits include vitamins A, D, E, and K as well as iodine and calcium. Marshmallow Root - for the intestines, kidneys, and bladder. Marshmallow Root is beneficial as a digestive aid and is known for its calming effect on the body. Oatstraw - for the nerves, uterus, stomach and lungs. Oats are a natural relaxant and contain flavonoids, a number of minerals, vitamins B1, B2, D, E, and carotene, as well as wheat protein. In the book, The Complete Medicinal Herbal, it even indicates that oatstraw may help with depression. Passionflower - for the nerves and circulation. Native Americans used to use Passionflower to soothe nerves. These days passionflower has been used for such things as hyperactivity, insomnia, Parkinson’s disease, and nervous tension. In Europe, Passionflower is used in preparing sedatives. Shavegrass (aka Horsetail grass) - for the kidneys, blood, heart, and lungs. Shavegrass contains flavonoids and minerals and has been used both internally and externally since the 16th century. Slippery Elm Bark - for the whole body. Slippery Elm Bark neutralizes stomach acids and also heals burns, wounds, and poison ivy. The Native Americans used it for that purpose as well as drawing out impurities. Slippery Elm gives a real boost to the adrenal glands and the respiratory system. Yucca - for the blood. The Yucca plant is somewhat like a cactus. The Yucca helps reduce pain and inflammation in the joints. It has also been used for generations by the Native Americans for soap. Even now, shampoo made with yucca as one of the ingredients helps improve the condition of the scalp and relieve dandruff. As I said earlier, the Canadian version of Composure has had to be re-developed because of newer government legislation. As a result, the R&D folks at AIM came up with another superb combo that would pass Canada's stricter regulations. Valerian Root - known throughout history for numerous healing properties, often referred to as "All Heal." Valerian is well known for its ability to enhance sleep, soothe anxiety, relieve nervousness, agitation, and general restlessness. Passionflower - used for infants and the elderly to help them sleep. Passionflower also helps to soothe a mind that is restless from anxiety and sleeplessness. 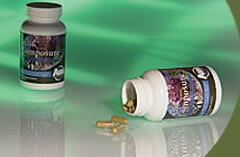 Hops Flower - a quality sleep aid that brings on restful sleep without negative side effects. Hops flowers are often used in "sleep pillows" for their ability to contribute to a feeling of relaxation. 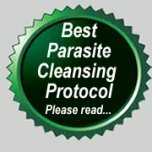 This potent combination of herbs in the Canadian Composure has been very effective for many years and has the approval of the German Federal Health Agency’s Commission E in their monographs,which is recognized worldwide as a premier authority on herbal/botanical formulas for health. 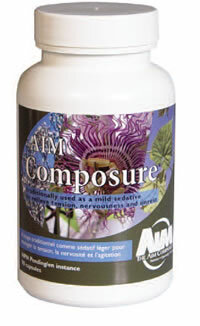 Composure is not available as a natural supplement for stress in some countries. If you are in Australia or New Zealand, you have access to the American/US version of the formula. If you are in another country and you would like to try this herbal remedy for stress, use the appropriate order form and I'll find out if it is available in your location and how much the cost and postage would be. 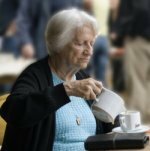 We all lead very busy lives these days, but it's important that we do what we can to maintain good health. Try to reduce the amount of stress in your life in whatever areas possible. But if you genuinely need a little help to relax and de-stress so that you can get your bodies much needed healing sleep, that's nothing to be ashamed of. But, don't turn to synthetic drugs. Try Composure for stress relief first.